A computerized bulletin board "posts" art for everyone to see. Ambassador Graphics & Wildlife Gallery has a telephone. By itself, that doesn't distinguish the North Charleston, S.C. art gallery from its competitors. However, Ambassador Gallery's telephone is special. Callers get much more than a polite greeting. They automatically get access to volumes of information on wildlife art and environmental conservation. Plus, they can search and view hundreds of works of art available from Ambassador. Yes, callers can view art over the telephone. Bob Chapman, Ambassador Vice-President, has equipped one of the gallery's phone lines with a computer bulletin board that sends art images and information directly to the caller's computer. Just like the old-fashioned cork and thumbtack bulletin boards, a computerized Bulletin Board System (BBS) is a place to post information. Users can call a BBS and request information or images from the menus and receive this information over telephone lines. Chapman's BBS, called Earth Art, is a computerized catalog of the gallery's art information and images. At the moment, Earth Art transmits over telephone lines, but Chapman also is making his BBS available over the Internet this month. However, the gallery has had its own World Wide Web site since 1994. [PHOTO: BBS] A computerized bulletin board "posts" art for everyone to see. 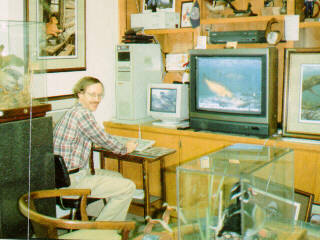 Above: Ambassador Vice President Bob Chapman is at the helm of Earth Art Bulletin Board System (BBS). The computer server (at left) transmits images to users, and the television screen (at right) is a display monitor for the laser-disc art catalog. [PHOTO: Gallery] Displays at Ambassador Graphics & Wildlife Gallery focus on the sportsman. Duck decoys and rustic-looking furniture compliment the art. Chapman launched Earth Art BBS in December 1991. "The goal was to get the word out that South Carolina has the No. 1 ranked duck stamp program in the country," he says. That designation is based on many criteria, including per capita money raised for environmental conservation. 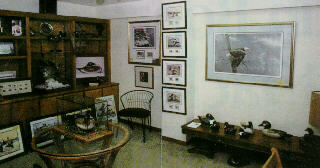 Consequently, the gallery is often mentioned in the same breath with South Carolina duck stamps. As a result, Ambassador has enjoyed frequent and prominent publicity. Chapman says the initial investment of $5,000 in BBS was recouped in its first six months of use. With an average ticket price of more than $200 for a framed print, Ambassador couldn't have sold so much merchandise in so little time without a simple, secure ordering system. Earth Art uses an ordering program that protects credit card transactions. Furthermore, credit card numbers are transmitted via telephone lines just as if a customer were placing an order verbally over the telephone. To use the BBS, a caller looks through the art images available. When he sees a piece of art that he wants to buy, he marks it with a command from an on-screen menu. He can continue to browse and flag items for later checkout, or he can check out immediately. At checkout, the buyer enters his credit card and shipping information. Earth Art then creates an invoice, and the buyer can choose to download a copy. Chapman designed Earth Art BBS to be easy for first-time users. In March 1994, ONLINE ACCESS magazine heralded Earth Art as one of the "Top 10 Bulletin Boards for Beginners" (out of 100,000+ worldwide). It continues to be simple for new and inexperienced BBS users to navigate. For instance, Chapman recently began offering a piece of computer software called BananaCom. With BananaCom, BBS novices need only slide their disks into the disk drive and enter one easy command. The free software automatically runs itself and connects people to Earth Art. Once connected, they follow a simple on-line registration process to become members. Chapman himself had no formal training in the operation of computer bulletin boards when he launched Earth Art. "I learned by trial and error," he says. "If you're interested in starting a bulletin board, I'd recommend familiarizing yourself with existing boards first." Experienced BBS users quickly learn shortcuts and options to enhance the power of the on-line tool - and there are more and more of those. "Although it was ahead of its time at first, we're convinced there's a fast-growing audience anxious to become connected," says Chapman. He says computer modems are becoming increasingly prevalent in the art and framing industry. Their primary use is for connecting to the Internet's World Wide Web and accessing e-mail features. In addition, some framers are being exposed to modems through companies like Wizard, which sells computerized mat cutters, because these firms use modems to automatically bill their customers. In 4 1/2 years, Chapman says, Earth Art has fielded more than 52,000 calls. On most days, that amounts to more than 35 calls. Earth Art can be tapped by three users at a time. There are two telephone lines that provide remote access while the BBS can be used at the main computer terminal in Ambassador Gallery. Among Earth Art's 4,800 registered users, Chapman estimates that only one-fifth are art customers. Because Ambassador is deeply involved in environmental conservation, Earth Art attracts conservationists as well as wildlife art customers. Most callers consult Earth Art to view the gallery's collection and to discuss conservation and art, Chapman says. Others use the bulletin board as a source for information about wildlife art and other free information that Chapman posts for callers. Since its inception in 1991, Chapman has improved the Earth Art system through continual updates. "When we started, the system was isolated because it wasn't part of any network," he says. Chapman even went so far as to create his own network - GreenNet - a network of environment-related bulletin boards. This network garners exposure and publicity for Ambassador's wares. Finally, Chapman has improved Earth Art's transmission time dramatically with the addition of a new modem that has more than doubled the rate at which data is transmitted to callers. Where it used to take up to 10 minutes for pictures to be transmitted, now they appear on the viewer's screen almost instantly. All of these improvements increase Earth Art's usefulness to callers. And the more useful Earth Art is to its customers, the more useful it is to Ambassador. Chapman uses Earth Art as an advertising and customer service vehicle for the gallery. He informs customers about gallery events and answers their inquiries. However, Chapman says, Earth Art's most useful feature is its novelty. "It really attracts people to the gallery and encourages word of mouth," he says. Another bonus of being on-line is the fact that it eliminates barriers of time and distance. No matter where customers are or what time it is there, they can view Ambassador's offerings. One of the most popular features of Earth Art has been the accessibility of artists on-line. Artists who've shown their work at Ambassador, and other artists like duck stamp competition winners, become members of the BBS. In this way, it is easy for callers to communicate with their favorite artists. Membership in Earth Art BBS is free; however, callers outside the Charleston area code must pay long-distance telephone rates. To sign up, simply call the BBS (803-552-4389) from your computer at any time of day, and go through the on-line registration process. However, if you prefer a human voice instead of bells and whistles, Ambassador has that kind of telephone, too. So, what do YOU think of this? Positive free publicity never hurts... I think the author did a fine job of "dumbing it down" so people without any knowledge about computers can understand. I hoped he'd mention that we have now installed ISDN (Integrated Services Digital Network) access, (data transfer up to 128,000 baud) but he thought that is too technical. He did agree Earth Art probably deserves the title as the "World's First Online Art Gallery", but his editors would never allow that to get printed. He told me claims like that "could only cause problems for our magazine".